I wanted to try something different that included pasta, but where pasta wasn’t the main part of the dish. Seems to me that far too often we make the pasta noodles the center of attention, when truly they don’t contribute any flavor at all! 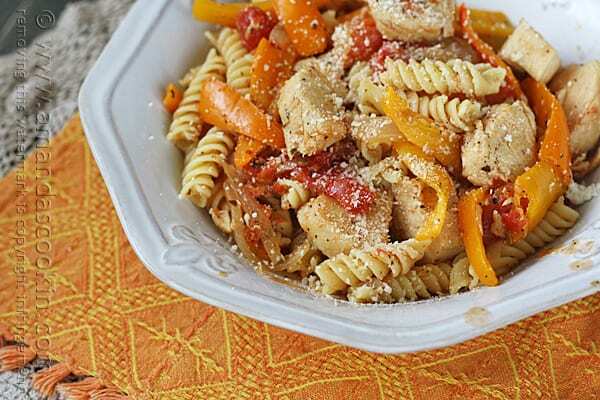 Something that does add flavor though are colorful sweet peppers and tender chicken. So I put this dish together, inspired by a favorite of mine, Sausage and Peppers. 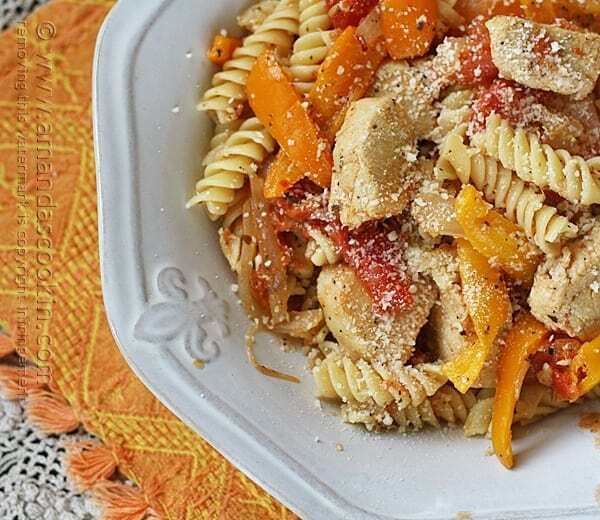 I only used half of a pound box of pasta for this dish as I really wanted the chicken and peppers to be the main course. I wanted the pasta to be an accompaniment. Once it was tossed together, there was no mistaking that this will be a dish I’ll make again and again! First heat 2 tablespoons of olive oil in a large skillet. Add the cubed chicken and brown it until no longer pink. 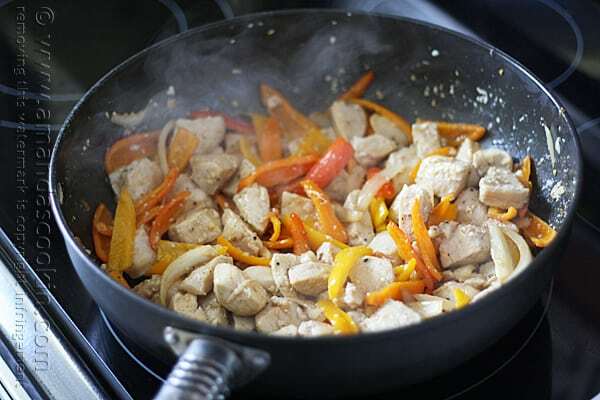 Remove chicken from the skillet and set aside. Do not rinse or wash the skillet. I used those delicious little sweet peppers that come in a combo bag, but you could easily substitute full sized red, yellow or orange peppers. Just weight them out before cutting up, you need about 10-ounces. Once mine were trimmed and sliced they weighed in at 8-ounces. 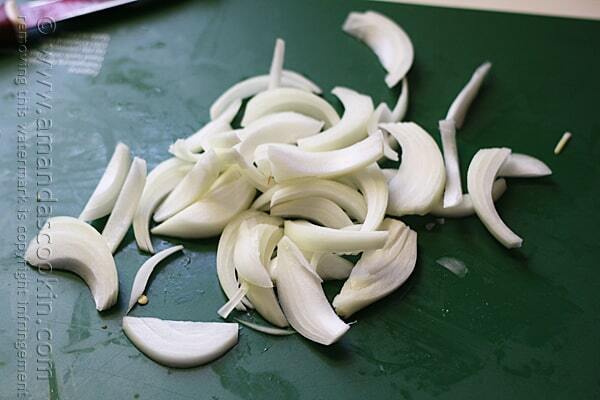 You’ll also need a medium sized onion cut into slivers. 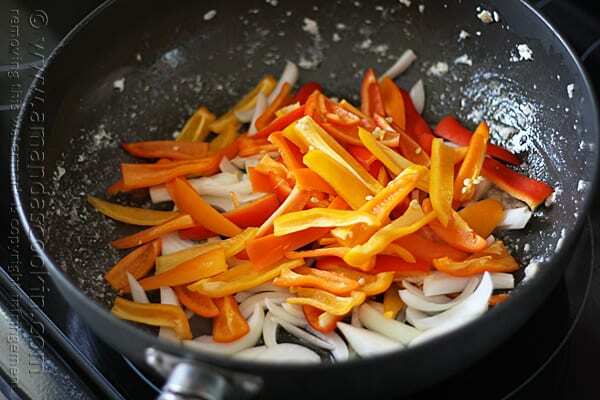 Add another tablespoon of olive oil to the skillet and sauté the peppers and onions for several minutes, until tender. Add the garlic and sauté 30 seconds more. Add the chicken back to the skillet and stir to combine. Next sprinkle in the herbs and toss to coat. Let it cook for just a couple of minutes, just until the herbs are fragrant. Add in the Vermouth. 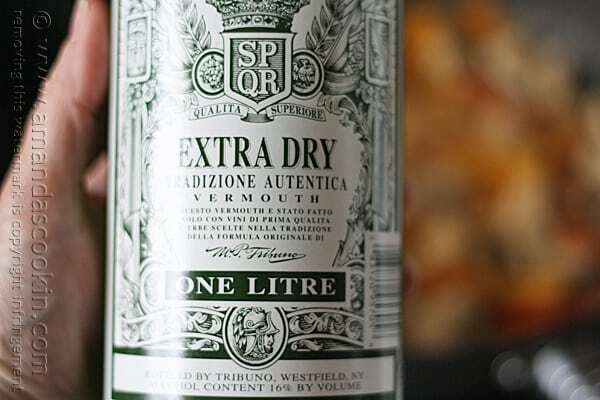 This bottle of Vermouth cost me $5.00 and lasts a long time. You can also use dry white wine or if you prefer, you can substitute in the same amount of chicken broth instead. Add in the can of Hunt’s diced tomatoes and chicken broth (that’s in addition to the broth you may have substituted for Vermouth!). Put a pot of water on to boil for the pasta. Give everything in the skillet a stir and bring it to a boil. Reduce heat and simmer. Stir every once in a while to mingle the flavors. You will simmer this until your pasta is cooked in the boiling water. Sprinkle the drained pasta with the Parmesan cheese. Toss to coat the pasta with the cheese. This will help the sauce grab the pasta and it adds flavor. 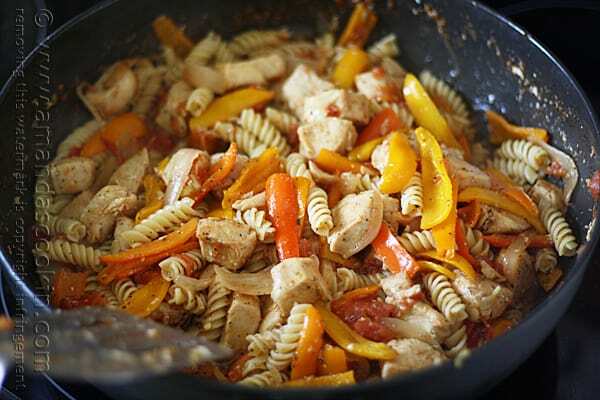 Add the pasta to the skillet and stir and toss everything together. 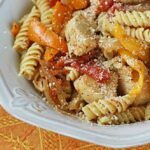 Serve with additional Parmesan on the side and enjoy! 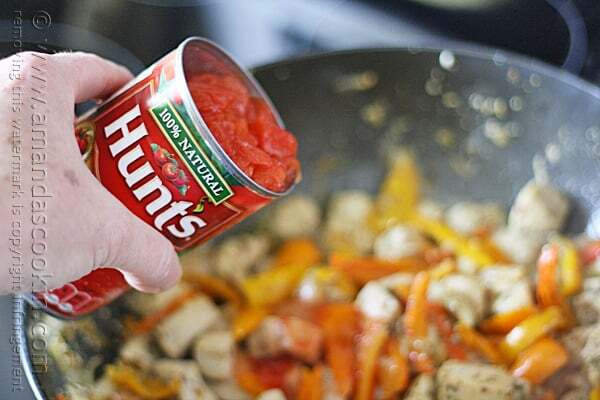 I have been selected by Kraft Foods to be an ambassador for KRAFT Grated Parmesan Cheese and HUNT’S Tomatoes. While I have been compensated for my time, my opinions are my own. 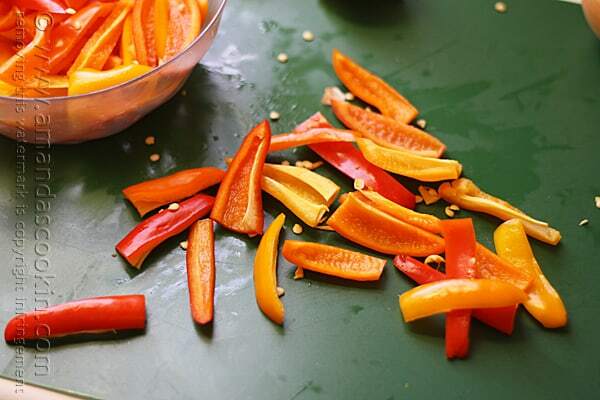 Colorful sweet peppers add wonderful flavor to any dish. 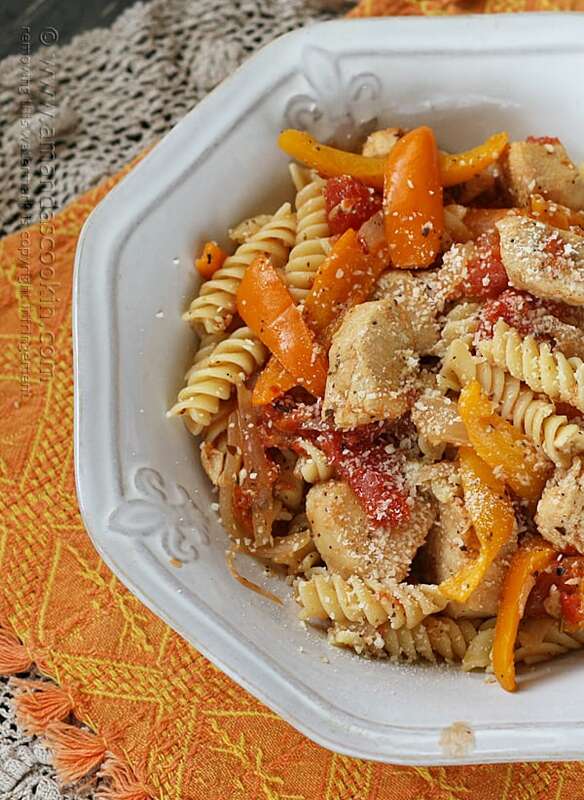 This chicken and peppers dish was inspired by sausage and peppers. Heat 2 tablespoons of olive oil in a large skillet. Add the cubed chicken and brown it until no longer pink. 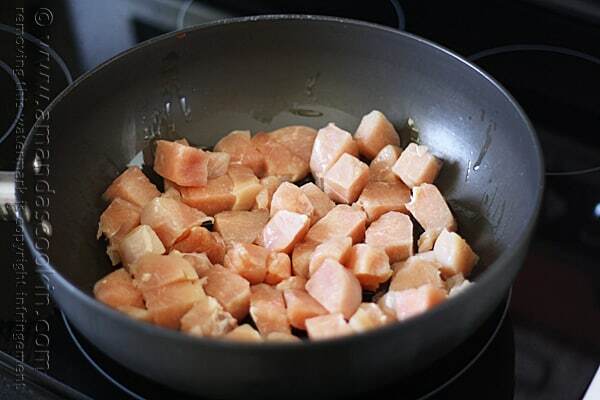 Remove chicken from the skillet and set aside. Do not rinse or wash the skillet. 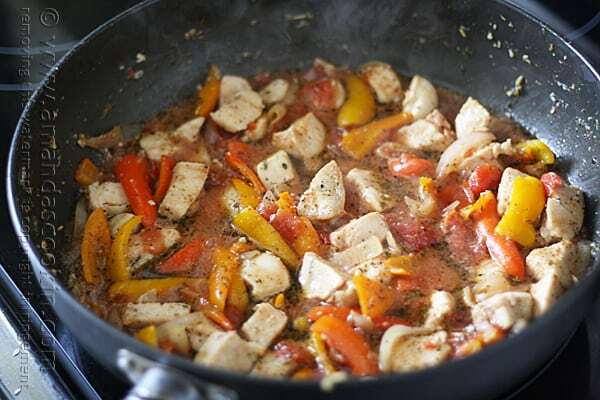 Add remaining 1 tablespoon of olive oil to the skillet and sauté the peppers and onions for several minutes, until tender. Add the garlic and sauté 30 seconds more. Sprinkle in the dried herbs and red pepper flakes and toss to coat. Let it cook for just a couple of minutes, just until the herbs are fragrant. Add in the Vermouth, Hunt's diced tomatoes and chicken broth. Give everything in the skillet a stir and bring it to a boil. Reduce heat and simmer. 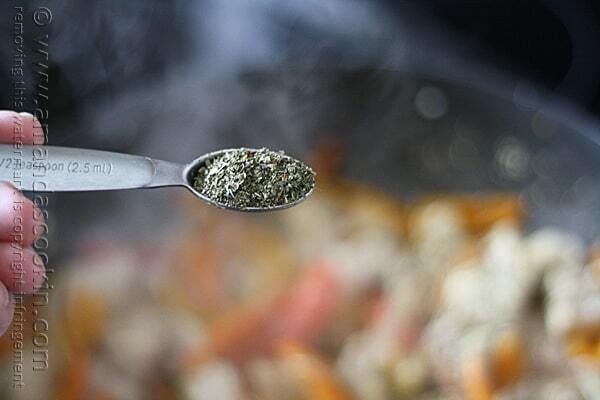 Stir every once in a while to mingle the flavors. You will simmer this until your pasta is cooked in the boiling water. 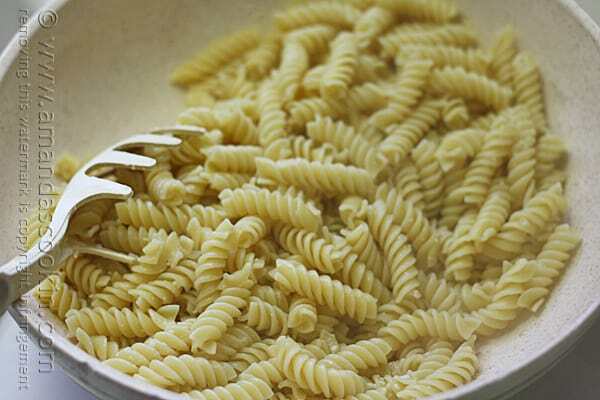 Drain the pasta and put it into a bowl. 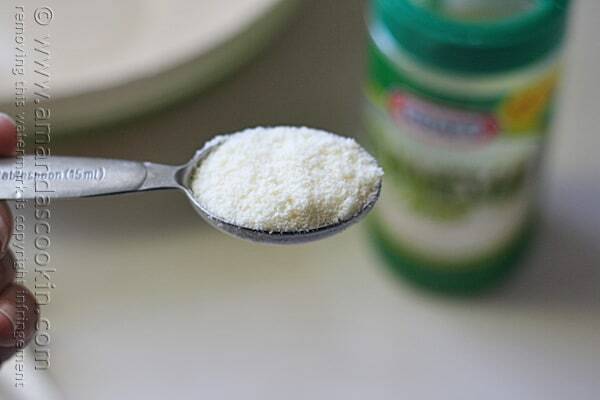 Measure out a tablespoon of Kraft Parmesan cheese. 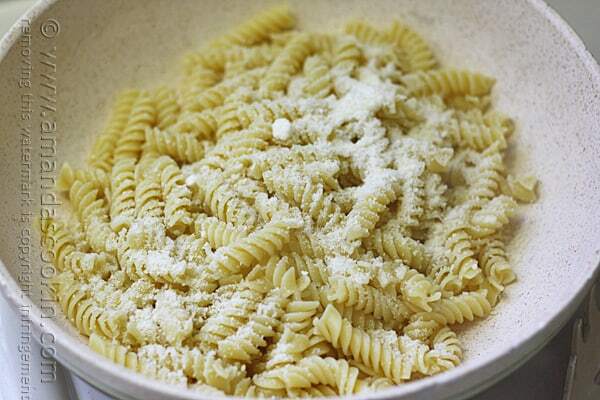 Sprinkle the drained pasta with the Parmesan cheese. Toss to coat the pasta with the cheese. This will help the sauce grab the pasta and it adds flavor. 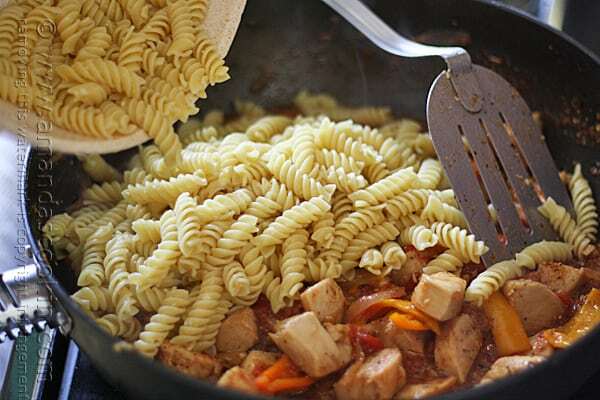 Add the pasta to the skillet and stir and toss everything together. Serve with additional Parmesan cheese on the side. 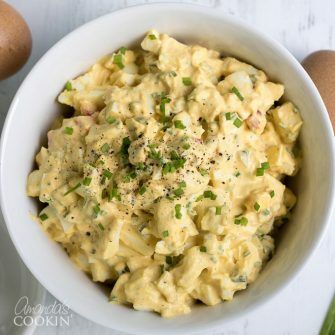 Tried this recipe tonight, and gotta tell you we just loved it. Clean, fresh flavors and easy to make. I didn’t have the fennel seeds, but substituted cumin. It turned out great! Thanks again, Amanda. So glad you enjoyed it Julie, thank you! I’ll bet that a pork tenderloin sliced into medallions would be just as tasty? Thoughts? This sounds like such a comforting meal – one I could eat slowly and savor and would want to be totally alone when I did. LOL.